Things have been getting hectic in Mystic Falls and at Whitmore, guys. And now, with Julian being back and Alaric discovering that his babies were trapped and now safe in Caroline, things are about to get even more twisted. Three years from now, Damon and Alaric are racing towards the studio where Caroline has just given her little speech. They know that they’re heading into a trap, but it’s better them than Stefan. Caroline is merely the bait and when Damon walks into the studio, he sees that it’s empty; it’s just a video of her speaking. This is a problem. Before he can take action, his back is shot with vervaine darts and he crumbles to the ground. In the present, Caroline is taking a pregnancy test to see if the mystical coven spell actually took and if she’s now carrying the twins and future of the Gemini coven. As Alaric points out, it makes sense for Caroline to have been the safe place. Her body can’t exactly die and they needed their line to continue. It’s a logical move when they knew they had to act fast. While Damon is chiefly concerned (and rightly so) with taking out Julian, Stefan informs him that they’ll be hosting Thanksgiving. This seems a little off to me since Stefan said he couldn’t eat real food in season one, but okay. Julian knows that the brothers want him dead and they need to be strategic rather than impulsive. What they need is an ally. Of course, he means their mother. Matt calls Caroline and informs her of what they found at the high school. He can’t get ahold of Bonnie and gets even more worried when he discovers she’s with Enzo. (Is this how they end up together in the future? Bonnie and Enzo is still so weird to me.) Despite taking them out, he said all of the people were back again that morning like they had never left. When he opens the door to the Grille, he finds all the tables are now occupied... by the people from the school. The brothers try to appeal to Lily and gain her help. Hoping to make her see how cruel Julian is, Stefan tells her how he had gotten Valerie pregnant and the role Julian played in it. Emotions flit across her face as she’s surprised, stunned, and confused. It’s not surprising that Lily doesn’t buy it, as she’s so swayed by Julian. But Damon can see what Stefan is doing. Again, they have to be strategic. That’s why Lily is now on the floor after drinking concentrated vervaine. Classic Salvatore trickery. Bonnie and Enzo are at the impound lot looking for Oscar’s car before Julian does. Enzo’s motivations are solely to win over Lily. Under the spare tire lies a sword. Among all of the bottles and various trash, that’s the only thing Julian is likely interested in. Bonnie recognizes it from her research of the Phoenix stone. The question is whether he’s worried about killing with it or being killed by it. Lily is just coming to as her sons explain that not only is Julian brainwashing her again, but that she has a pattern of falling in love with the wrong men. She just can’t see it. We’re transported back to Thanksgiving in the 1800s. For the first time in the series, we get a real look at the man Papa Salvatore was. He was harsh and intense, manipulative of his wife. It’s the manipulation that they point out in the present. She’s impressionable and susceptible to abuse. Whether she likes it or not, she’s going to help them kill her paramour. Over at the Grille, Matt shows Caroline the group of compelled people. Their IVs are filled with saline to keep them hydrated for long periods of time and there’s not a single bite mark on any of them. Suspicious, seeing as they believe this to be the work of the heretics. Matt wonders if they’re fattening the cattle for slaughter. This causes Caroline to totally toss her cookies into the trashcan. Instead of being honest, she doesn’t tell Matt what’s going on. Quickly diverting the conversation back to the well-fed zombies, she wonders if the compulsion can’t be siphoned away. But Valerie knows that it’s senseless to do so. If she were to siphon off the compulsion from this particular group, they’ll simply just be replaced by another. She wonders if this is a safe place for Caroline to be, seeing as she’s a pregnant vampire. Despite the signs and putting more faith in the pregnancy test, Caroline denies it and promptly freaks out on her. She quickly apologizes and pleads for her help. Well, it’s worth a try, I guess. Enzo and Julian act like two schoolboys ready to scrap on the playground for the affections of the same girl. Julian respects Lily’s request of no more bloodshed in her house, so they obviously take it to the woods to duel. Yes, a duel. Swords and all. The vervaine bonds sear into Lily’s skin as we’re taken back to that Thanksgiving past. Their father asks Lily to fetch him a bourbon, taking her out of the room. He accuses the boys of taking money from him as he lights a cigar. Smoke clouds around him as he sternly tells them to do what’s right. Damon decides to take one for the team and lies saying that he took it. He raised neither liars nor thieves, and quickly grabs Damon’s arm, burning it with the cigar. Lily knew that Giuseppe was a monster. She knew what he had done to Damon that night. Before she can explain herself, a cut appears on her neck. Someone is trying to kill Julian. They ask her how she could know that. To protect him from her sons, they did a spell binding Lily and Julian’s lives; if he dies, so doe she. Talk about a wrench in the plan. Breaking from the compulsion, Caroline turns around and compels the group again to forget what happened. She catches herself in a mirror and wonders if what Valerie said might be true. Matt asks if she wants to talk about It, but she maintains there is nothing to discuss. Beau comes into the Grille and sees what they have done. He does a spell that causes Valerie and Caroline to fall and before he can hurt them more, Valerie stabs him and places and invisibility spell over them. Enzo stalks slowly through the forest spotting blood on a rock. Julian had disappeared but he was close. He sneaks up behind Enzo as his sword drops. Lily cleans up the blood from their mutual cut and admits to Stefan that she had taken the money from their father. Stefan doesn’t understand how she could let Damon take the blame over herself and then stay with the man for years afterward. All Lily wanted to do was get them away from Giuseppe, but he was always one step ahead of her. He had found the train tickets she intended to escape with. She knew that he was a monster. She knew that with eyes wide open. With his threat to take them away from her, she stayed. Everything was to protect them. The fight continues in the woods, but is stunted when Damon knocks Julian out. Or at least he thinks he does. Julian comes up from behind, but Damon is quicker and stabs him in the heart. Lily falls to her knees as blood drips from her mouth. The sword is turned as Julian shutters. Bonnie walks into Alaric’s office to find him drunk and alone in the dark. She opts to stay in his office to find out more information on the sword. Quickly she finds what she needs. The Phoenix stone gives the sword its power against immortal foes. Something about this doesn’t sit well within the office. Damon informs Enzo that Julian is using Lily as a human shield, oblivious to the fact that there are people hellbent on seeing her dead. They both think Lily is dead but then... plot twist! Julian comes up and snaps Enzo’s neck, confusing Damon. Clearly, this is where the “Oh, no” Bonnie uttered regarding the sword is going to start making sense. The girls make their escape from Beau, and Caroline asks her to stop with the evasion. Valerie seems to know plenty about the spell that the coven placed on Caroline to keep the twins safe, and she wants the truth as to why. As Valerie talks, Caroline puts the pieces together and finally finds out the secret Stefan has been hiding. Their story might have ended badly, but Caroline can help see that Alaric’s story doesn’t. 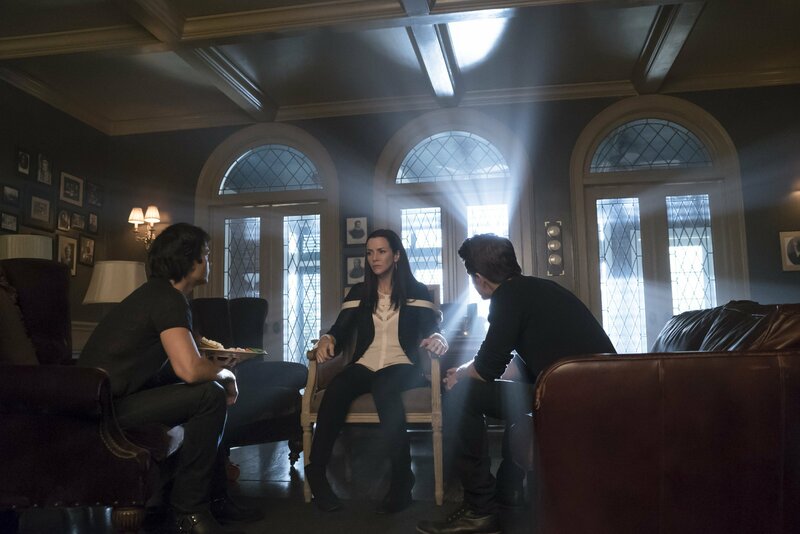 Stefan and Lily intervene in the fight between Damon and Julian, asking what’s going on. Damon has once again acted impulsively and tried to kill Julian so he can kill two vampires with one sword. Julian makes a sly comment about that not being able to kill him seems to be lost on the brothers at this time, but it’s certainly an important note. Matt tells Bonnie that Jeremy and Tyler (throwback!) think they know of a way to deal with the compulsion problem and that he’s going to look into it while Stefan and Damon disagree over how the day was handled. It doesn’t matter what the real story is, Damon will never get over how Lily faked her death, ditched them and has spent the past century trying to forget them. It’s a testament to their acting ability that they can be both angry and hurt in such a beautiful way in this scene. Stefan doesn’t even try to stop him from leaving. Questions of what Julian was doing in the woods with Enzo and why he would engage in a duel knowing his life was bound to hers flood out of Lily. But the most important question she asks is if he knew that Valerie was pregnant with Stefan’s child. There’s a moment of hesitation before Julian plays dumb and it’s obvious that he’s lying. Now it begs another question: Does Lily believe him? She willingly forgives him, but could she just be doing it for appearance's sake? The moment takes her back in time to Giuseppe apologizing for the way he handled the train tickets. The exchanges are almost identical and it seems as if she’s finally seeing what her sons have been trying to tell her. An ultrasound reveals that there is neither one nor two babies inside Caroline. Alaric apologizes for believing that this was possible and for putting her through that. Valerie comes in and they inform her that she was wrong. Again. “Are you sure about that?” she asks and siphons something from Caroline’s stomach. It didn’t make sense that the spell pointed toward Caroline and the tests came up negative and then it clicked when she used the cloaking spell against Beau. The coven would have done anything to protect the twins from harm, so they too were cloaked. When she removes the spell, the three of them see the twins on the ultrasound machine. Not only is there finally a shred of light in the darkness of their lives, but this is a great way to cover up actress Candace Accola’s pregnancy. The doorbell rings. Lily walks in and realizes that they were right; she had traded one monster for another. Stefan’s plan worked! Lily has a plan and, having been in his pocket for so long, knows that they won’t get caught this time. But knowing the track record of this group, something will happen. It’s just a matter of when. What is the significance of the sword? What is it that Jeremy and Tyler suggested to Matt? What is Julian actually doing with the group of people plugged into the IVs? And most importantly, what exactly is Lily planning to do when her life is bound to his? Ugh. Until next time, my fine friends!